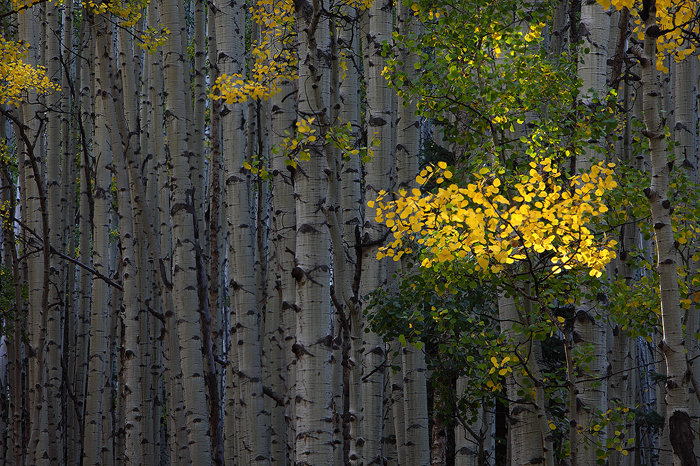 I began my fall adventures with a trip to Aspen. Independence Pass is the quickest (and most scenic) route for me to get there. On the east side of the pass there is this really neat little barn. Every time I drive past it, I tell myself I'll stop and take a photo of it next time I go by. I finally did. 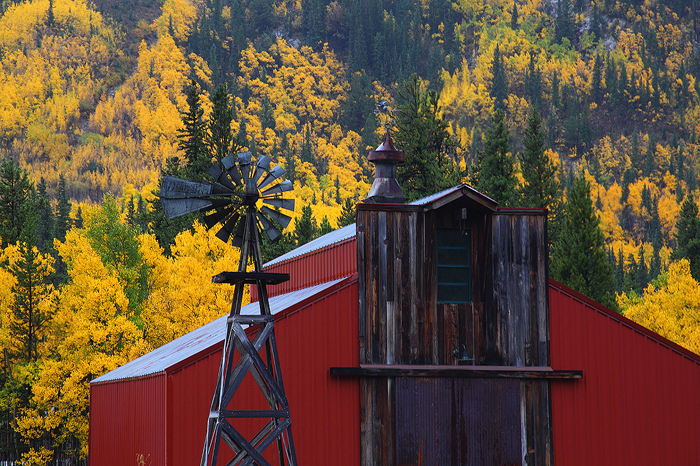 I liked the way the yellow aspens contrasted with the red of the barn. 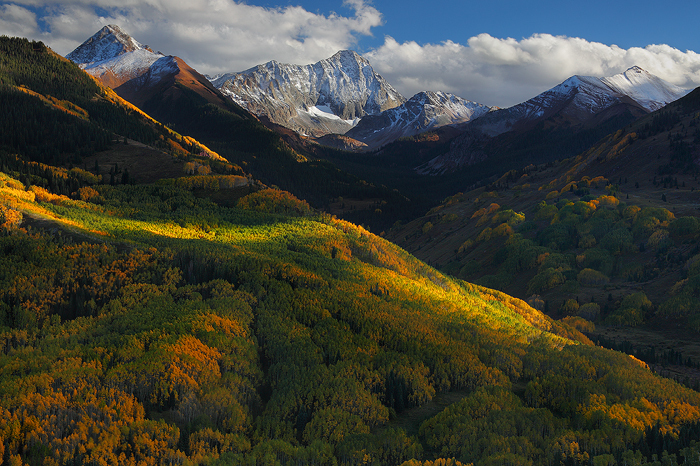 My main reason for my trip to Aspen this year was to make an image of this scene. 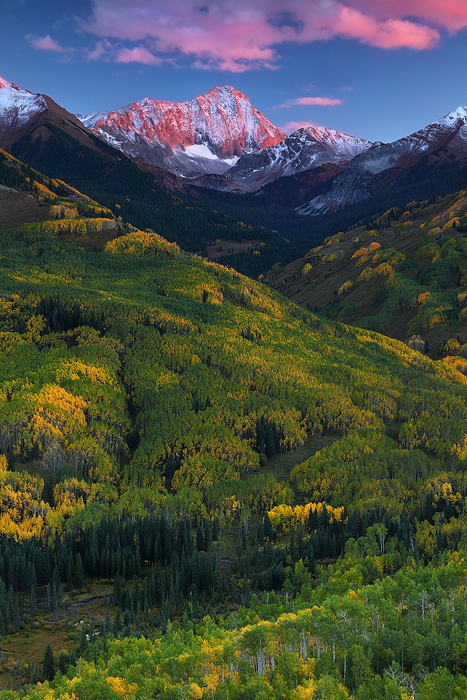 This is Capitol Peak, near Snowmass, CO. It's one of the many "fourteeners" in the Elk Range. 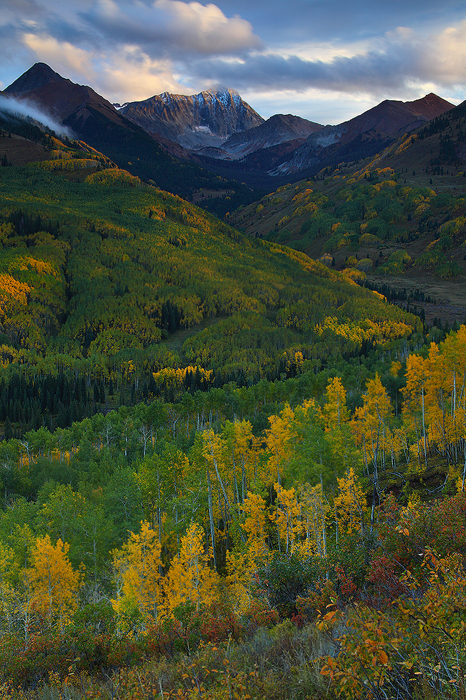 The view from this vantage point in the White River National Forest is just unreal. It's a place you need to see to really grasp the beauty. My first sunset here yielded some decent results. There was a slight dusting of snow on the peak and the sunset was almost really nice, but I knew it would take more effort than just one try. I returned to this spot for a couple more sunsets before I finally got a shot I was happy with. 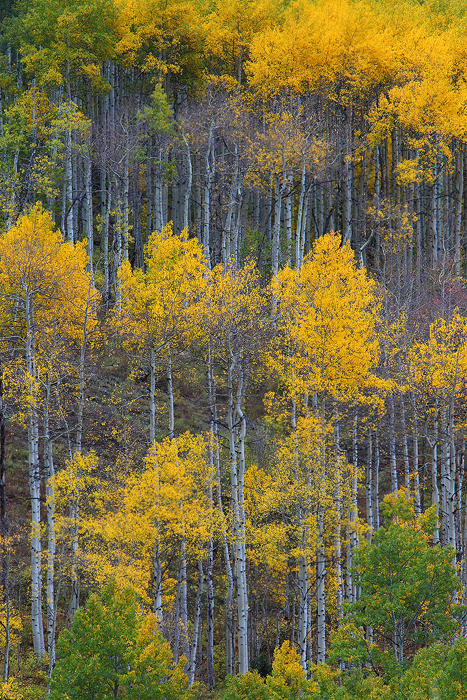 During the days, I took advantage of the overcast skies by looking for some more intimate photos of the golden aspens. As you can see in this photo, the colors were still pretty varied. Some of the trees in this area were already bare, while others were still summer green. 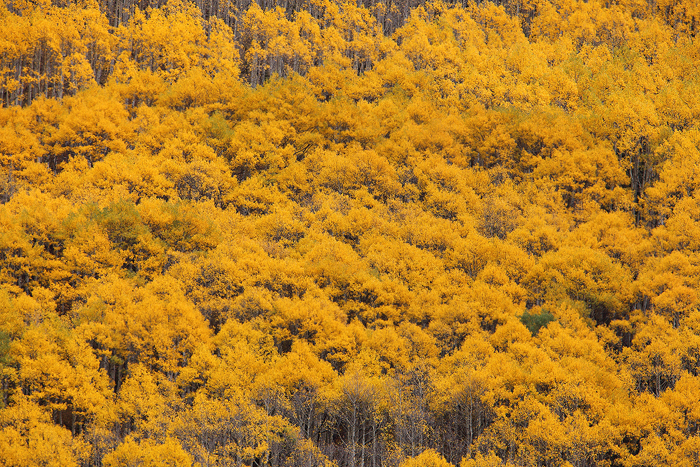 Golden aspens in the Castle Creek Valley. 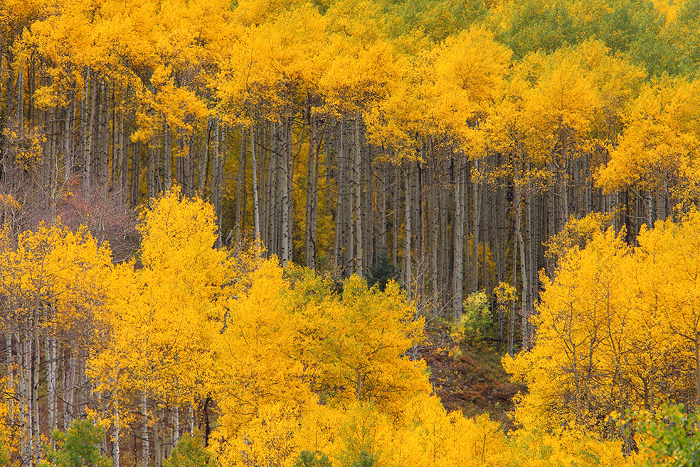 This fall, more than other years, I saw a lot of really unique color variations throughout the many aspen groves. These light orange leaves really caught my eye. 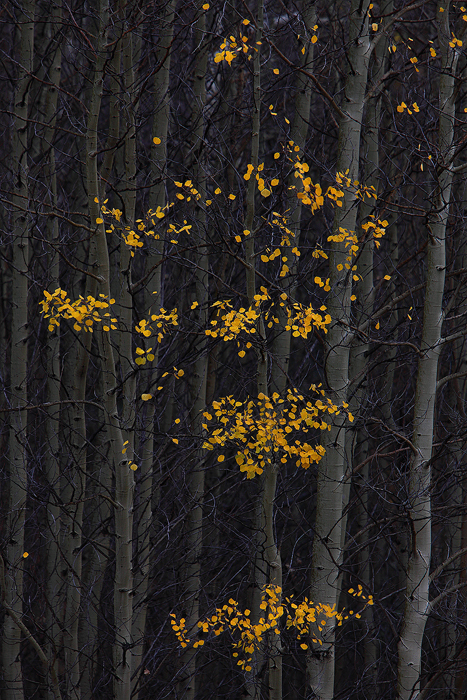 A particularly thick grove of small aspens created dark shadows within the forest, contrasting with these few aspen leaves that were still clinging on to their branches. 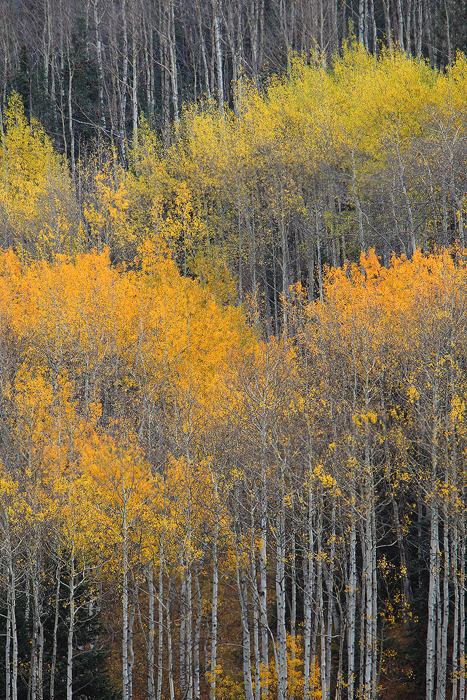 This is why they named it "Aspen"
Unfortunately, these trees were about a mile up the mountainside, but I had to snap a picture of the amazing coloring. 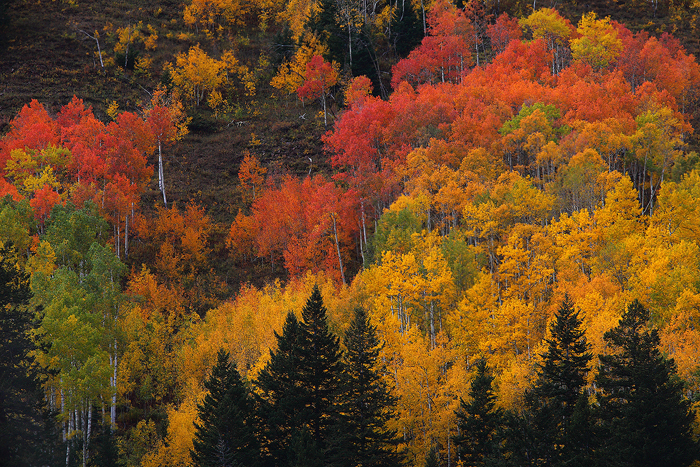 Aspens ranging from green to a deep red all in the same little grove. 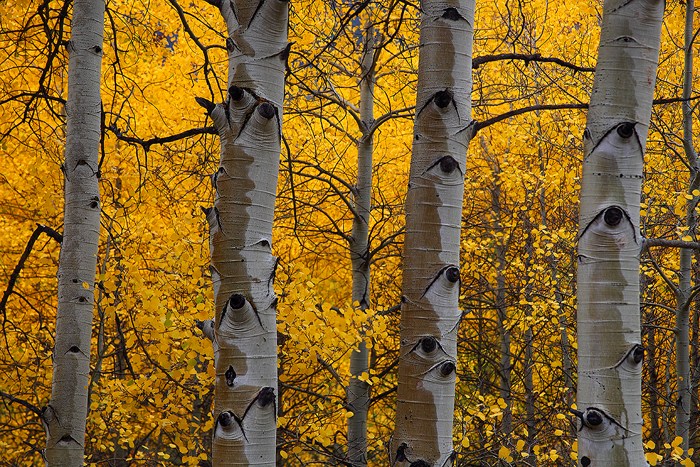 A very interesting color that I've never seen in aspen trees. I got a great little surprise on my way back up to the view of Capitol peak. I spotted, from far away, what I first thought was an ermine. I pulled my car over and waited a few minutes to see if it would come back. Sure enough after about 10 minutes it popped its head out of the tall grass. 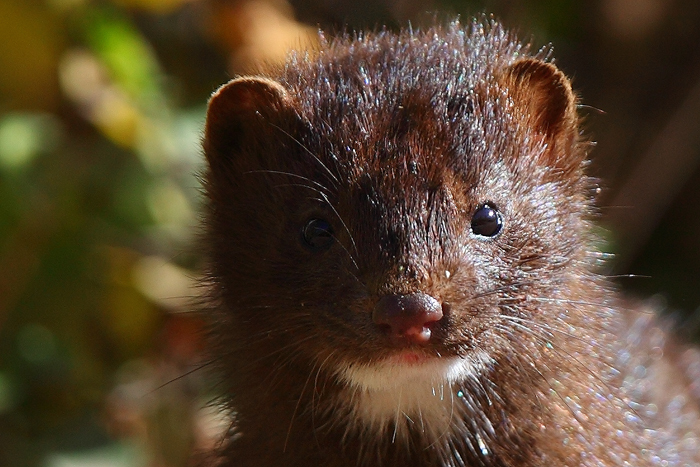 To my surprise it was actually not an ermine, but a mink. 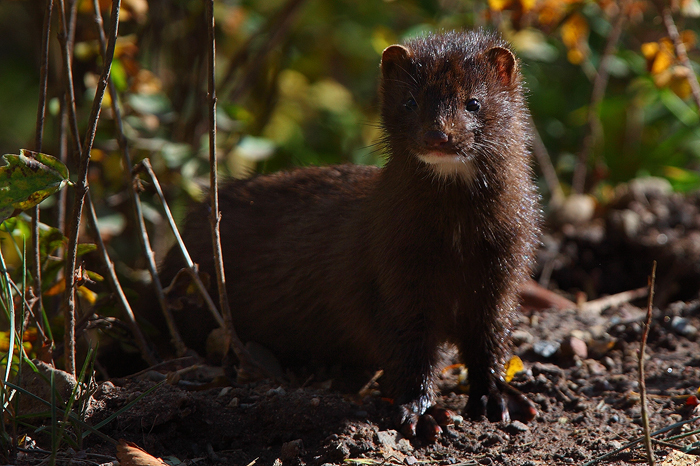 The mink was very inquisitive and would pop out of the grass to check me out every 20 minutes or so. After about an hour of this back and forth between the mink and myself, it surprised me once again by popping out of the woods with a brook trout. 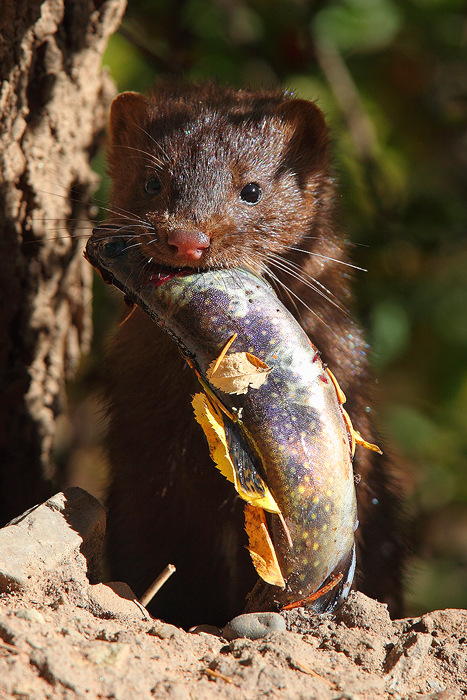 Mink love the water and are quite skilled at catching fish. After showing off the fish for a minute or so, it ran off in the other direction. This was probably good because it was getting close to sunset and it would have been hard to leave this little guy. 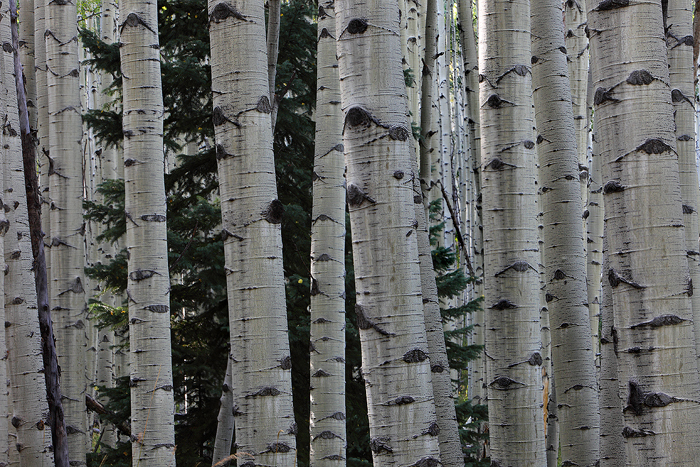 On the way to the view of Capitol Peak you pass through a few really beautiful Aspen groves. I couldn't resist stopping to take some photos. 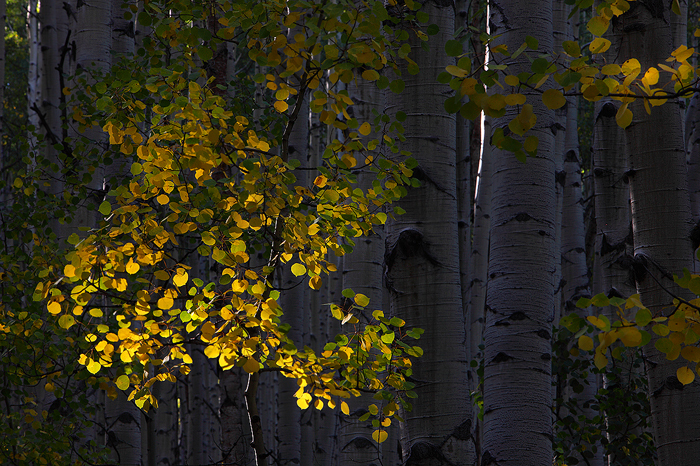 The sun was getting low on the horizon and was peeking through the forest just enough to light this one branch of leaves. 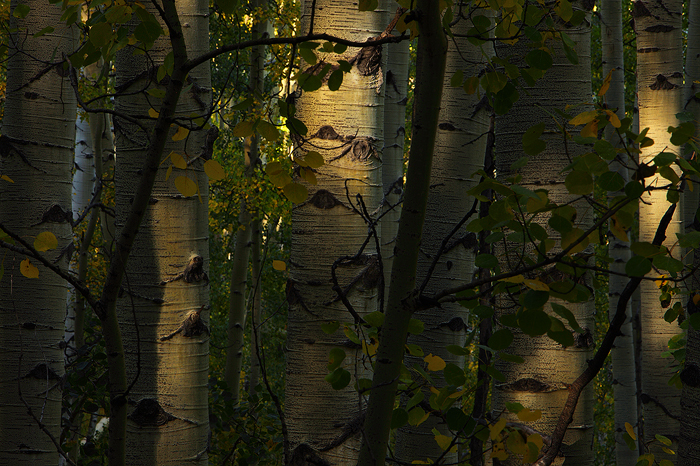 More beautiful light and aspen trunks. After a few welcome distractions I made it to the Capitol Peak view I've been wanting a photo of for so long. It was an hour or so before sunrise, but already, the light was spectacular. Since my first evening here a few nights before, the mountain had received another dusting of snow. This time it was a lot heavier. 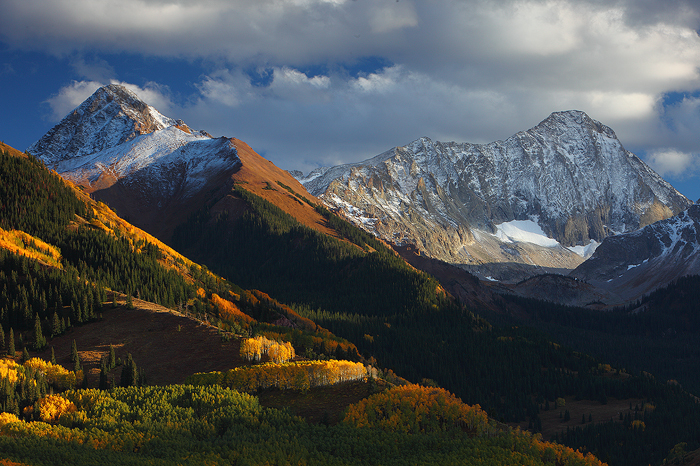 There's nothing like golden aspens contrasting with the freshly dusted white peaks. After many nights waiting for everything to come together I was rewarded with this amazing sunset. The pink alpenglow on the mountain was just unreal. After my first week of travels around Colorado I checked the weather and realized there weren't going to be any clouds for the next 10 days at least. I quickly made a change of plans, and decided to head to the Tetons. 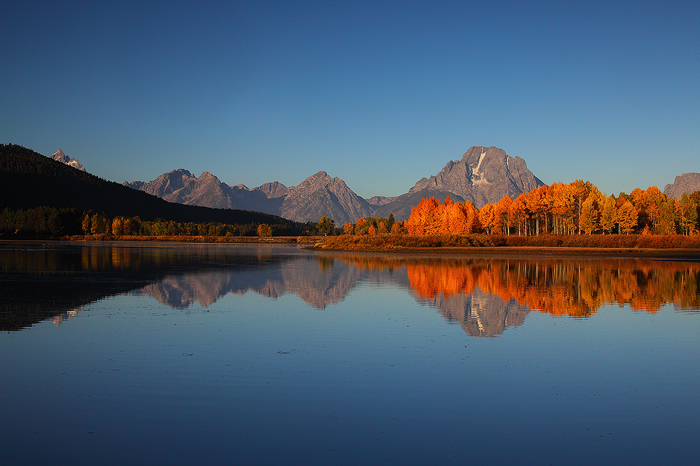 I drove straight through the night and got to the Oxbow bend just in time for sunrise. As you can see, the Tetons were experiencing unseasonably warm and dry weather, much like Colorado. It was a beautiful scene nonetheless. This photo was taken at dawn, about 30 minutes before sunrise. The first rays of light hit the top of these mighty peaks. Mt Moran can be seen on the right. The Grand is the mountain peaking over the hill on the far left. Suddenly the sleepiness from my all night drive has worn off. Here, just as the light begins to hit the beautiful aspen grove on the Oxbow Bend, a beaver decides that it would be a good time to swim through the reflection of Mt. Moran. It added a few big tail slaps for good measure. At one point the beaver came up onto the shore and stared down another photographer for a few seconds. Apparently this beaver does not like photography. That's the great thing about the Oxbow bend though. Aside from the amazing scenery, it is absolutely teeming with wildlife. At any given time you can expect to see, eagles, moose, bear, elk and many other birds and mammals. Just don't expect them to cooperate with your photographic endeavors. 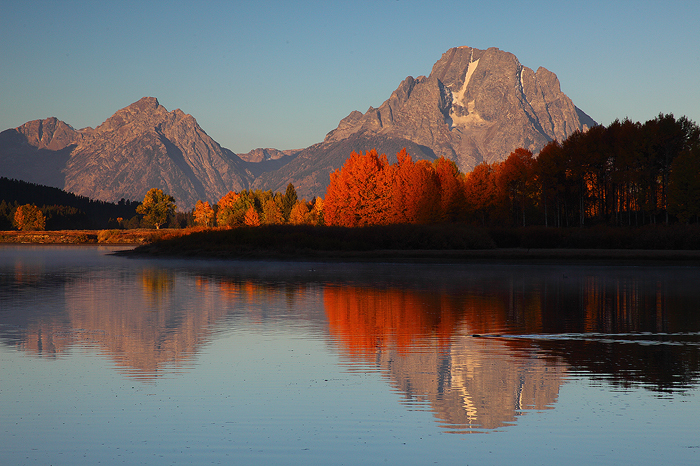 A beautiful indian summer morning on the Oxbow Bend of the Snake River. I think if I had to think of a theme for this years fall trip it would be "black bears" they were everywhere. 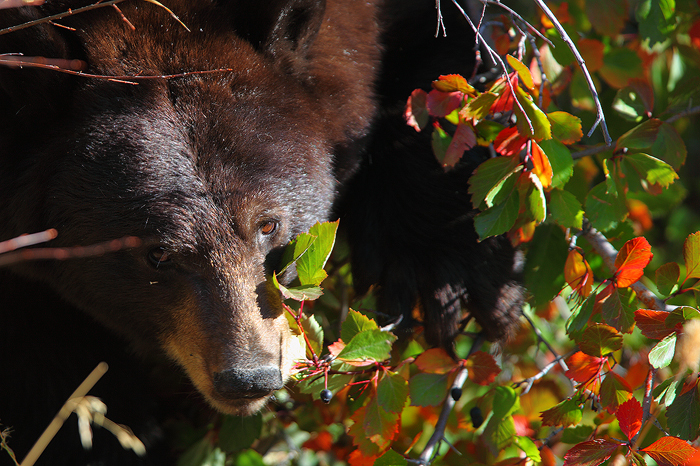 Currently in a state of hyperphagia, these bears spent all day in the plentiful hawthorn berry bushes, putting on as many pounds as possible. The thick brush they were feeding in made photography a bit difficult, but allowed for some great opportunities for close ups. It was also fairly hilarious to watch these guys climb around in trees that could hardly support their weight. 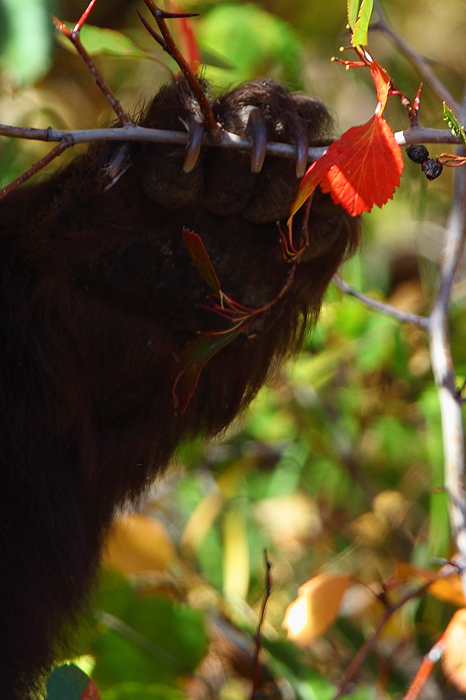 I've been lucky enough to observe bears in many different environments and situations, and one thing that always amazes me is how precisely they can use their huge claws as tools. Whether cracking open a clam in alaska or stripping berries from a branch, they are truly impressive animals.